Even in the wake of Fred Phelps' death, members of the Westboro Baptist Church continue to use hate as their weapon of choice. But counter-protesters at a recent gathering chose against fighting hate with hate and offered a message of love. Westboro Baptist Church followers gathered at Lorde's concert at the Midland Theatre in Kansas City, Mo., on Friday to protest the singer for "serving herself and teaching other young people how to be indolent rebels." The protest came just one day after the death of the WBC founder. But a group of counter-protesters made sure their message was heard, too. Megan Coleman helped make a sign that read "Sorry for your loss," in reference to Phelps' death. "We realized that it wasn't so much about antagonizing them," she told Kansas City's KSHB, "but sending out the countered safe that we are here for people who need that message and need that positivity." We are saddened to hear of the passing of Fred Phelps Sr. We have sent our sympathies to the Phelps family and plan to assist them in their time of grief if needed. The philosophy of the Equality House has always been to overwhelm hate with unconditional love. A loss of a human life is never a reason to celebrate, even if you have a stark disagreement. Fred was a father, grandfather, and great grandfather that was loved deeply by his family. Let us remember that we are all in this world together and vengeance is never justice. Phelps' daughter, Margie Phelps, told WIBW that no funeral will be held for the pastor. Watch KSHB's report about counter-protestors at the Lorde concert. 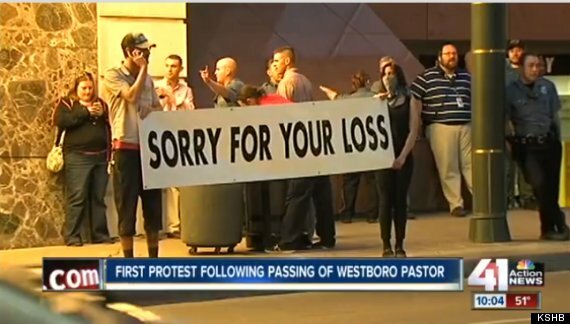 The Westboro Baptist Church threatened to picket <a href="https://www.huffpost.com/entry/westboro-baptist-church-steve-jobs-funeral_n_998032" target="_hplink">Steve Jobs' funeral</a> but called it off when the memorial service was held privately.